Arts & Entertainments and Film: Our last installment of the Summer “Games” continues with a multicultural and multilingual look at cinema around the world. Take a sneak peak! Freestyle’s methodology embraces film and subtitles to widen and deepen everyday/colloquial language. Your mission, should you choose to accept it: Challenge yourself with a few of these videos and clips, test your comprehension. Want more?! See our teacher’s “Favorite Films”. Our Spanish students watched the Mexican film Agua Para Chocolate (Like Water For Chocolate), a masterpiece filled with memories of the old Mexico and the magical realism, or lo real maravilloso, that is so prevalent in Spanish novels and films. After reading the following summary, you’ll see a list of preguntas used to guide our discussions after watching the film. These activities improve both auditory and oral skills as well as critical thinking in a second (or third or forth!) language! Esta película está basada en una novela del mismo título escrita por Laura Esquivel. La autora adaptó su obra para el cine y en 1992 Alfonso Arau realizó su producción. Los personajes principales son Tita (Lumi Cavazos), Pedro (Marco Leonardi) y Mamá Elena (Regina Torné). La historia ocurre en México a finales del siglo diecinueve y los primeros años del siglo veinte. 1. ¿Quiénes son los personajes principales? 2. ¿Qué temas explora la película? 3. ¿Qué representa la cocina? From a sensual Mexican film, we moved into the broader territory of Latin American films. Do you know the difference between Latin American cinema and Latino cinema? Listen to Cine Las America’s director Eugenio del Bosque explain en español. Transcription below. Bueno y aquí se pone un poquito más complicado. Esto que les voy a hablar es un poco la diferencia entre el Cine Latinoamericano y el Cine Latino que es el que se hace acá en los Estados Unidos. Por lo general el cine Latino que se hace en los Estados Unidos, y luego está esta parte en inglés. Yo creo que lo más obvio que podemos decir del Cine Latino es Robert Rodríguez, que todos lo conocemos en Austin. Que no ha hecho más que yo creo que una película en español. Eh, ¿El mariachi está en español, verdad? 1. Todo Sobre Mi Madre, 1999: A Spanish-French comedy and drama that deals with complex issues such as AIDS, faith and existentialism. Voyagez with us and découvrez what our French classes explored in the literary and cinematic world of La France. 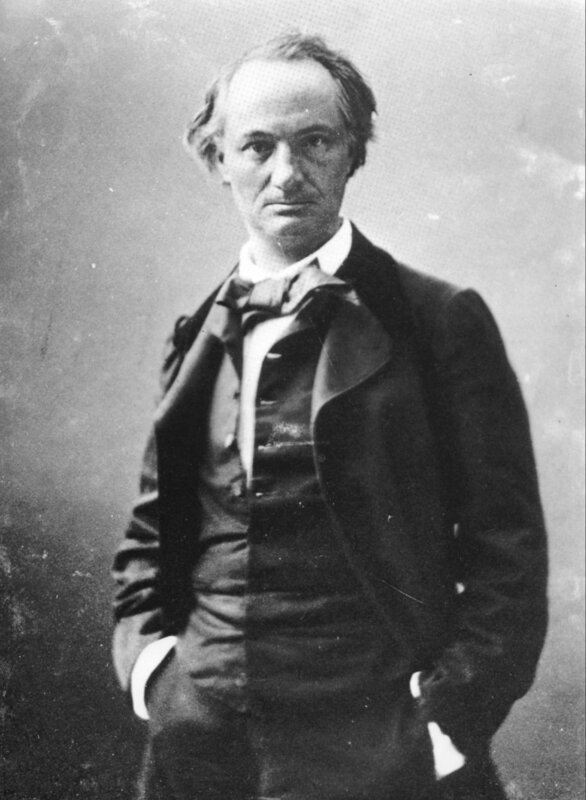 Activities included reading and interpreting les poèmes de Baudelaire, learning poetry terms — le thème, la rime, le ton, etc.– after which they wrote their own collaborative poems en français using the entertaining game of Cadavre Exquis. Regardez la bande-annonce (watch the trailer) of this award-winning French film, then fill in the blanks of the first few lines. Au courage! Je viens chercher _________________ par rapport aux… _____________ ! …Assedic. · Comment vous vivez l’idée d’__________________? Ça ne vous gêne pas de _____________ sur le dos des autres ? · Ça va, merci, et vous ? · Vous pensez que vous serez quand même capable de _________________? · Vous en avez de______________ ! – J’en ai tellement que je suis prêt à vous ________________________ pendant un mois ! Je parie que vous ne tiendrez pas ________________________! · C’est un truc de ___________ ça ! – Non, mais, vous avez fini de jouer, là ? · Et, mais en fait, vous __________________________ là ? Central Station, a touching drama in Portuguese, takes the viewer around Brasil, offering a rich view of culture as well as language. After watching the following trailer, you’ll see a list of perguntas used to guide our discussions after watching the film. 1. Dá um pequeno summário do enredo do filme. 2. Dá 3 adjetivos para descrever cada personagem. 3. Quem são os personagens principais? UT educator Antonella Del Fattore-Olson and two Austin-based filmmakers Romina Olson and Sergio Carvajal created ITAL, a digital channel that blends entertainment and education to teach Italian language and culture. The entertaining ITAL videos are intended to increase students’ vocabulary and oral competency in a fun relevant way, which is why Freestyle will be adapting them as excellent teaching tools! As you can see in the video that follows, part of ITAL’s instructional component is reflected in the use of subtitles – sometimes in English, others in Italian – to emphasize how new vocabulary is used in everyday conversation. 1. La Vita e Bella, 1997: A Jewish man has a wonderful romance with the help of his humour, but must use that same quality to protect his son in a Nazi death camp. The Summer “Games” Series may be over but continue to follow us for yet another exciting blog installment. Love the idea of foreign films but feeling intimidated by subtitles? Stay tuned for our next series, “Embracing Subtitles”!